I’ve never had Chins, but they seem like fun little pets. I know their lifespan is about 15 years so they definitely require a commitment. And if you knew the answer to the question, you know they have some special care requirements. 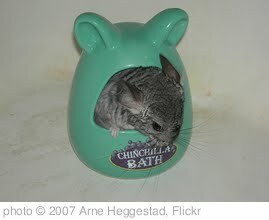 A: Chins take dust baths. The dust baths help clean their fur and remove grease and oil. Here’s a video showing how they take their bath. Watch for next week’s question and another chance to get an entry into our monthly contest! How cute is that Chin?